The world has evolved and in this digital age, many of the procedures in Dentistry have evolved and improved as well. North Alta Ave dentist Dr. Zaveri uses state of the art digital dental x-rays and digital cameras to meet with the demands of the aging world. These advancements offer great benefits to the patient. The benefit of digital dental x-rays is that they emit less radiation compared to traditional machines in order to get a diagnostic picture and they also help the environment by eliminating the usage of chemicals to process the film. Digital x-rays also permit the keeping of digital records of the case, so that they may be kept in computer filing, along with the computer chart. For record-keeping purposes, digital x-rays and even digital photographs make amazing contributions in the dental office so Dr. Zaveri makes use of these innovations in the office. In the diagnosis and identification of disease, your dentist carries out various procedures so that he can effectively determine what problem needs to be dealt with. Proper diagnosis of oral disease is very important because the right address can only be forwarded when the condition is properly identified. 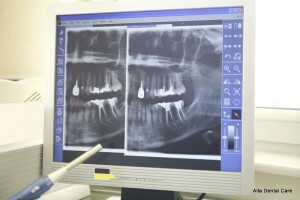 Digital radiographs give your dentist a two-dimensional picture of what is going on in the mouth. Clinical examinations can only reveal so much. 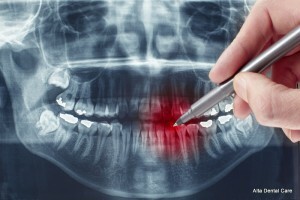 Radiographs are able to take images of the teeth and the bone to reflect any problems within the inner tissues. It gives a more definitive measure and assessment of what is going on in the mouth and a particular tooth. Using a dental film and an appropriate x-ray machine, the picture is taken. Science and technology aims to make improvements to various industries. In Dentistry, there are all kinds of innovations that improve the level of care and support that is being afforded to patients who seek dental care. Consult with your trusted dentist, Dr. Zaveri today to experience the benefits of advanced technology in your dental treatments. Call Alta Dental Care at 909-985-6116.